Flat point socket set screws have a flat surface on one end and a hexagonal drive at the other. 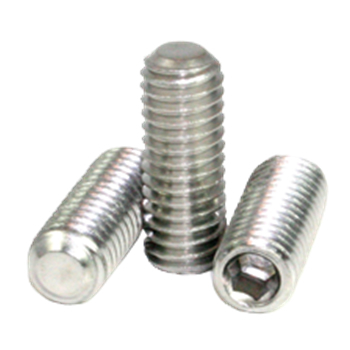 Flat point set screws are designed for frequent resetting or relocating on hard steel shafts and where minimal damage to shafts is necessary. Ground flats on the shaft improves the contacts. See our nice selection of flat point socket set screws in alloy black ox, alloy with a nylon patch, 18-8 stainless, and various metric sizes. The selection is nice and so are the prices.